Taken after the first visit. Patient’s eye improved slightly and could open by 2mm. 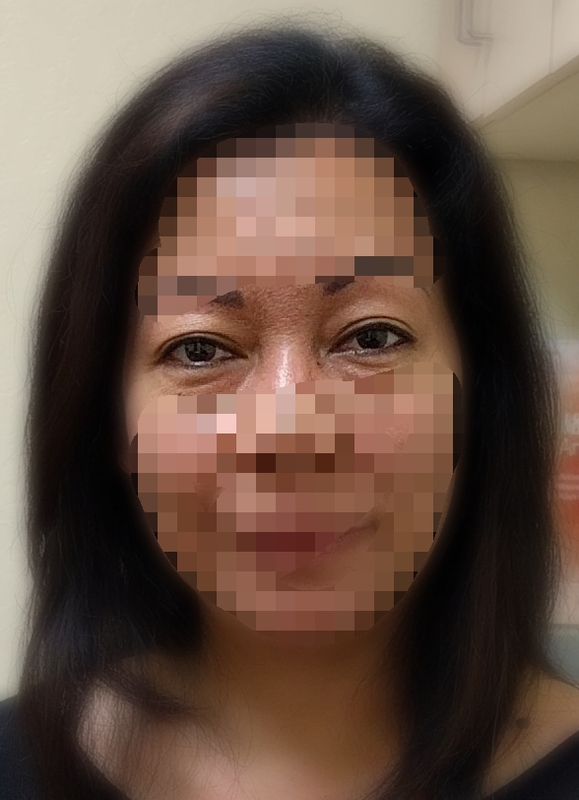 Patient E is a middle aged woman from South East Asia. She came to see me for her severe case of Guillain-Barre Syndrome (GBS) in March of 2016. Her condition began after her trip back to her home country in January. 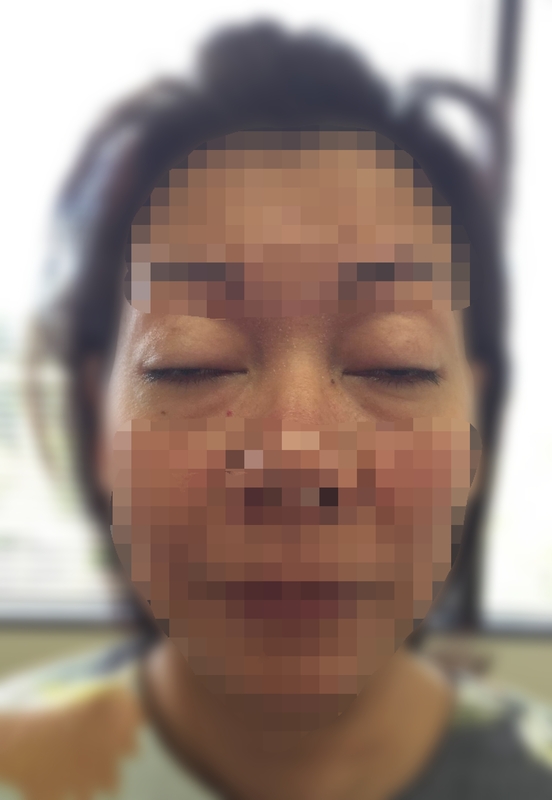 She developed severe diarrhea, numbness and tingling in her hands and feet, extreme fatigue, constant migraine headache, nausea with frequent vomiting, and worst of all, she lost all muscular control over her eyes and eyelids. When she first came to see me, she walked in with one hand holding her husband while the other hand keeping one eye open with her fingers. A specialist nearby diagnosed her as Guillain-Barre Syndrome (GBS) and proceeded with daily treatment of IvIg. After two months of treatment with IvIg, she did not improve and her symptoms got worse. Her nausea and vomiting increased and her headache intensified. From my experience, IvIg is not an effective treatment. Patients often come to me after their IvIg treatment failed. 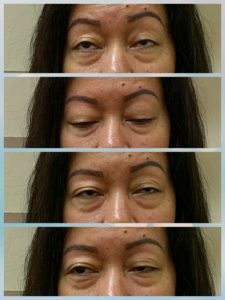 This patient decided to stop her IvIg treatment and to try acupuncture and Chinese herbs alone. The patient responded very well to our treatments. Right after her first acupuncture session, she could open her eyes by about 2mm. We gave her Chinese herbs to take at home. Patient improved significantly after just one week. On her second visit, which was a week after, she walked in without holding her husband because she could slightly open her eyes. She still could not move her eyeballs but at least she could see without using her fingers to keep her eyes open. Moreover, her nausea was much reduced. She did not vomit anymore and her headaches were much less frequent. The numbness and tingling on her hands and feets were slightly reduced as well. She felt very optimistic about her improvements and saw us weekly for the first month. After one month of treatment of acupuncture and herbs, the patient continued to improve. 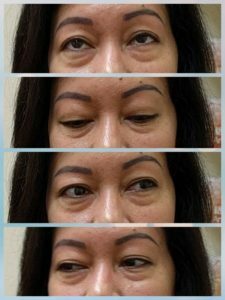 She could open her eyes about 50% and some muscular function of her eyeballs had recovered, as you can see in the pictures below. She only had slight nausea but no more vomiting, and her constant headache was gone. She only had one headache a week at most. Although she still could not return to work, her fatigue was much reduced allowing her to be functional at home. 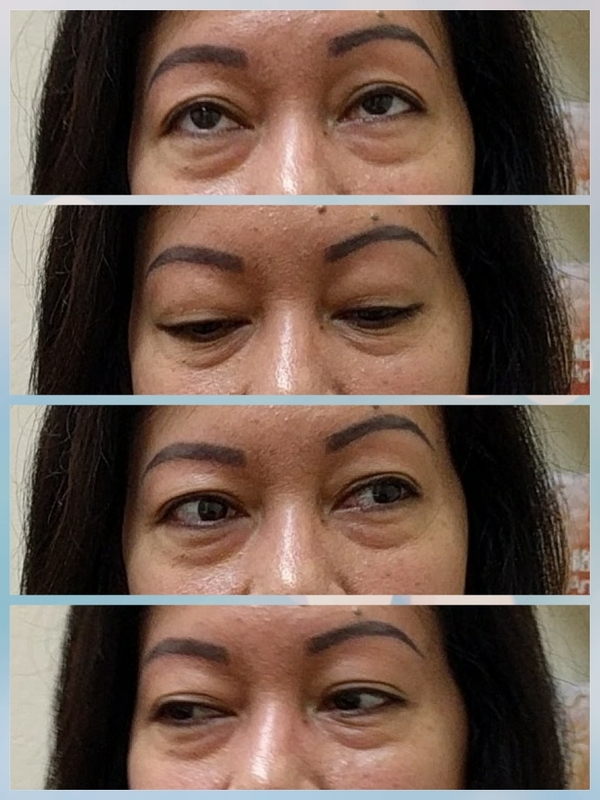 Patient’s eye movement after a month. After another month of treatment, she could open her eyes almost completely. The patient could also move her eyes freely in all directions. To most people, the patient appeared normal. However, the motor function of the patient’s eyes was still lacking. The coordination between the eyes was not yet very smooth. The patient could not focus on fast moving objects, thus prohibiting her from driving. When she turned her head quickly, slight nausea would return due to blurred images. 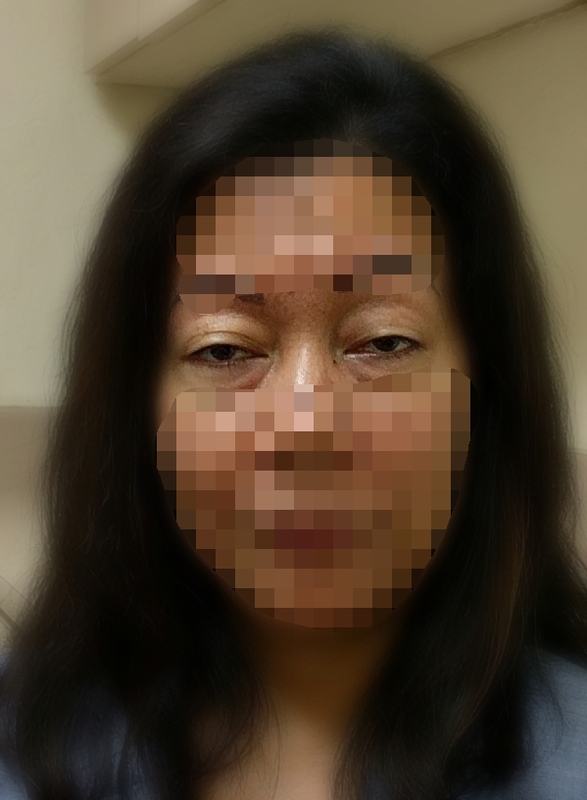 After two months, patient could almost open eyes completely. The patient continued treatment for another month. All her symptoms has disappeared. Her eyes can move freely without any vision problems. Not only did she recovered fully, she felt she was much healthier and stronger. She has never felt this well for a very long time. By the time the patient was released, she could drive and work normally. The total duration of treatment was around three months and the total cost of treatment was about two thousand dollars. Patient’s healing was mostly complete. Patient could move eye almost freely.